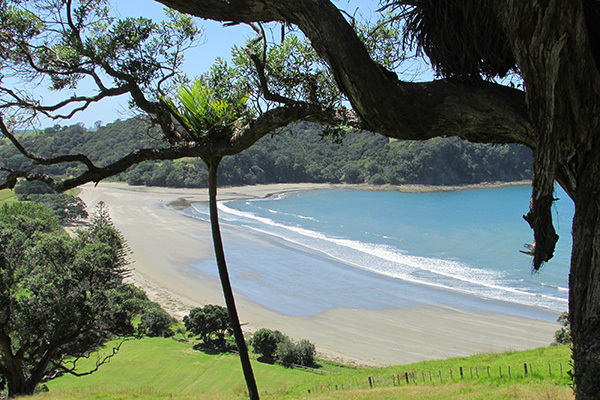 For 45 years, the Mahurangi coastline between Waiwera and Ōpahi has been in public ownership begging to host a nine-kilometre coastal trail, linking 900-hectares of regional parkland. But while the potential of the trail has existed since the 1973 public acquisition of coastal Te Muri, it wasn’t until 12 months ago that its future became official. 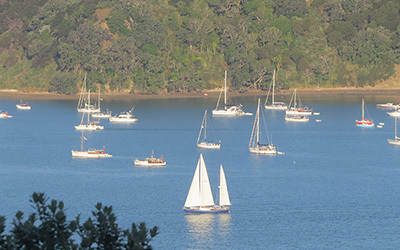 Trail design is now underway with the goal of obtain planning and consenting approval in time for the launch—with major sources of funding pre-approved—of a surgically targeted crowd-funding campaign at the 2019 Mahurangi Regatta. The current goal is to open the Mahurangi Coastal Trail for the summer of 2019–2020, beautifully setting the scene for the 50-year Te Muri celebrations. …it can be walked however is on the side of SH1 which can be very busy. We recommend kayaking as it is much safer than walking these busy roads. Extreme care should be taken, and if you have a hi-viz vest and/or pack cover we recommend wearing it. The year before the national walkway opened, the 383-hectare Peter Schischka farm was added to Auckland’s regional park estate, potentially providing a walkable scenic ridge farm road connecting to little-used Hungry Creek Road, and thence to Pūhoi. With Auckland Council now convinced of the need to prioritise this route for walking, the planets are finally in alignment for the coastal trail to be developed, responsibility for which has been assumed by the Mahurangi Coastal Trail Trust, established in 2015. The principal physical challenge to walking the coastline between Waiwera the Mahurangi Harbour is the Pūhoi River. Its estuary, at low tide and in places, can be waded, through water barely knee-deep. At high tide, however, particularly at the river mouth, the four-knot current would test even an Olympic swimmer. Several footbridge options were explored by the coastal trail trust, but even the ‘elegant option’ tracing a sinuous route across the estuary, at nearly 300 metres in length, was, on reflection, likely to fail to meet the regulatory landscape and visual impact protections, the highest which the estuary enjoys. Another possibility is the provision of a chain cable ferry. Such ferries are common throughout Europe. This … could become a unique attraction in itself, without the need for large infrastructure crossing the river. Design of a cable ferry to operate at the Pūhoi River Mouth is now earnestly underway. The operation won’t be cheap, but then nor would have been a footbridge, with the same officers’ report warning of a possible $10–20 million cost. What it will be is fossil-fuel-free, and significantly, but possibly not entirely, tidal-river powered. The upside of a ferry, as opposed to a bridge, is the expectation that a charge would be involved. 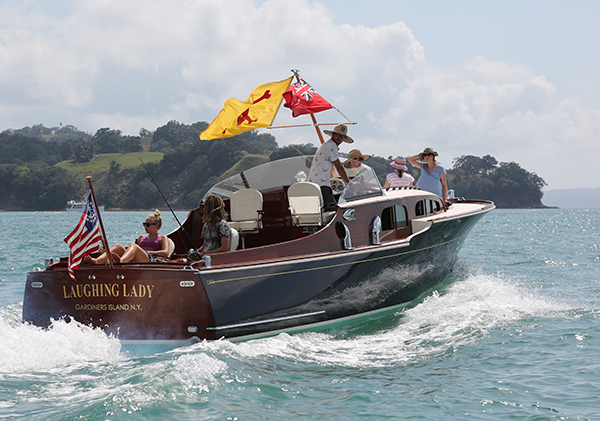 The trust believes that this can be kept nominal, by manning the vessel with certificated, volunteer crew—currently volunteers fight for the privilege of working at Wenderholm, and the roles couldn’t come sexier than skippering a Pūhoi River Mouth ferry. The local economic impact of the Mahurangi Coastal Trail, although impossible to forecast definitively, will be significant. Fifty thousand people per year walk Queen Charlotte Track, in the Marlborough Sounds; Waiwera, on the map as a tourist destination for 170 years, is the northern metropolitan transport terminus of New Zealand’s largest city. The coastal trail will link Waiwera with Pūhoi and Mahurangi West, where boutique accommodation is beginning to reach critical mass. The better part of 50 years may seem a forlornly long time for a coastal trail to materialise, but with the rapidly dawning realisation that fossil-fuel-free forms of recreation and tourism are essential if the splendid isolation of Aotearoa is to be sustainably enjoyed, the timing is profound. The Mahurangi Magazine values thoughtful comments that make their point or points politely and constructively. Unsubstantiated contradiction and other devices of detraction that are the hallmark of all too many loosely or unmoderated comment sections will go unpublished. Comments may be edited for style and clarity; email address is required but will not be published.